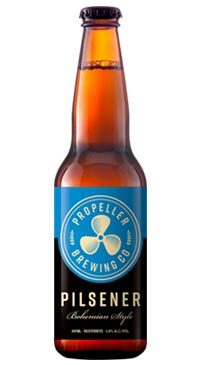 One of Nova Scotia’s original microbreweries, Propeller Brewing Company, located in Halifax, produces a wide-range of International award winning, all-natural, British-style ales and lagers. Pilsner is a style of lager that originated in Plzen (pronounced Pilsen), Czechoslovakia in 1842. Prior to that time, most beers were made with top-fermenting yeast and were dark in colour and somewhat hazy. In 1842, an innovative Czech Brewery used a ground-breaking technique of methodical bottom fermenting with a new strain of yeast. The resulting brew, Pilsner, was a refreshing golden and bright beer that has now been adopted by breweries all over the world. Propeller Bohemian Style Pilsener, is a refreshing brew in the classic lager style of Bohemia. Made with a blend of Canadian and European malts and prized Noble hops, Propeller Bohemian Style Pilsener displays classic Euro-lager characteristics: a slightly sulphurous nose, distinctive Continental hop aroma, a light malt sweetness and a refreshing bitter finish.